Discover a gated, lakeside community at the foothills of the Blue Ridge Mountains where you will meet new friends and enjoy an active lifestyle in a natural setting. Lake Keowee is a pristine blue-water lake that boasts year-round golf, tennis, pickleball, boating, fishing and water sports. The Keowee Key community is a welcoming network of social activity with its many clubs and leagues. Clemson is just 12 miles away and Greenville is only a 45-minute drive. 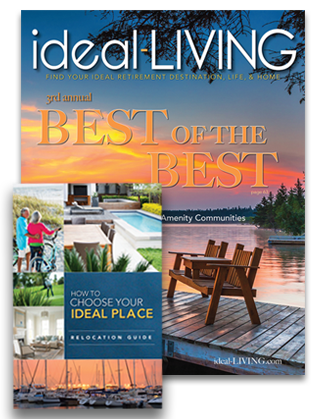 Keowee Key is selected as Best of the Best Tennis & Pickleball Community and Best of the Best Lake View Community by ideal-LIVING Magazine. We invite you to enjoy the Blue Ridge Mountains. Please be our guest as you explore the abundance of lifestyle and resident options that await you at Keowee Key. *$399 package is based on current offering, seasonal rates may affect final pricing. Please contact Keowee Key staff for details. Package only available for first time visitors and guest of Keowee Key. Offered on a first come first served basis, limited availability. Restrictions may apply. Subject to change without notice.